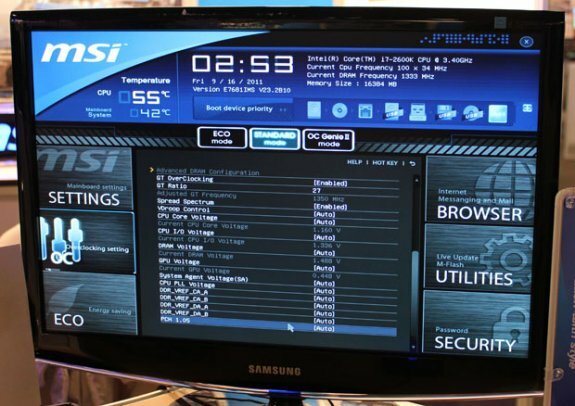 The Tech Report writes MSI presented a revamped UEFI firmware at Intel's IDF in San Francisco. The site says the new attempt looks a lot better than MSI's first UEFI effort. MSI is keenly aware of the issues with its first UEFI effort, and ClickBIOS II addresses many of those problems. The new interface feels smooth and responsive, at least in part because mouse tracking has been sorted out and wheel support has been added. I did notice a couple of instances of flicker while flipping through the menus, but it wasn't an annoyance—or a seizure risk. The GUI has been completely overhauled, and it looks much better than what we saw with the first wave of 6-series Sandy Bridge boards. MSI is still refining a few elements, through. The company says it's going to add the ability to key in variables like clock speeds and voltages directly rather than forcing users to make selections from lists of options or hammer the + and - keys to make incremental adjustments to their current settings. Improvements to what remains a relatively basic fan-control scheme are being explored, as well, and we could see memory and stability testing utilities added to the UEFI.